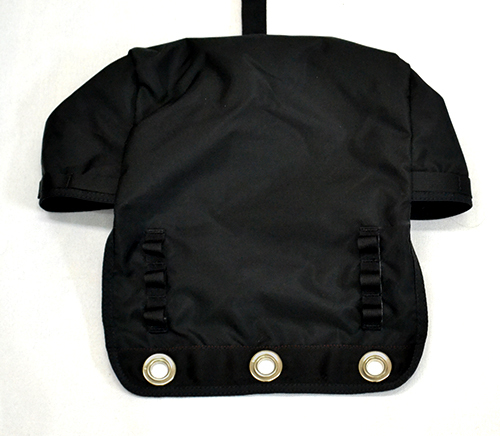 The Standard Main Chute deployment bag has 3 grommets on the closing flap of the deployment bag. The structure with 3 grommets was selected as the most reliable/safe for situations when somehow one of the closing rubber bands is broken or accidentally opened. Under the grommets there are inserts added to prevent damage to the grommets when installing, and to make grommets slightly sink in the material to prevent a possible damage to the closing rubber bands and lines. There are two sets of the line stow loops – at the sides of D-bag and close to the center. Placing line stow loops close to the center helps to prevent the bag swinging when lines are released from rubber bands and reduce the chance of linetwist. 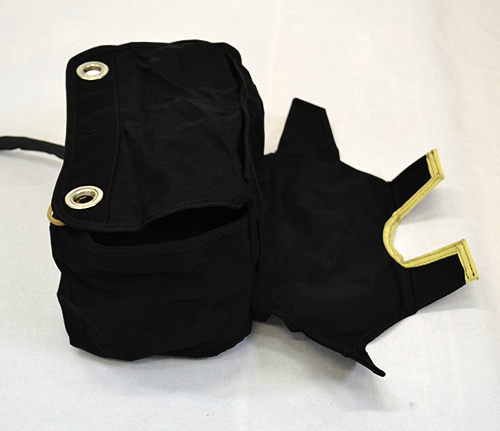 We produce main deployment bag that closes on two rubber bands and the other lines are stowed in a pocket. Stowing the lines in the pocket reduces risk of linetwist and the rubber bands prevent premature opening, which is possible in bags that are closed with magnets/flaps.